Turn signal switch. For full size street legal electric scooters, bikes, and mopeds. Built-in three wire terminal connector. 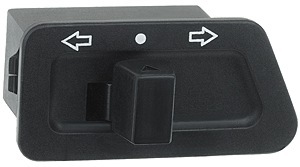 Handlebar mounted switch cluster for electric scooters and bikes. 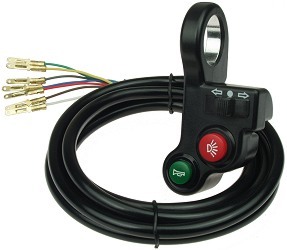 Switches for turn signals and taillights, turn signals, and horn. 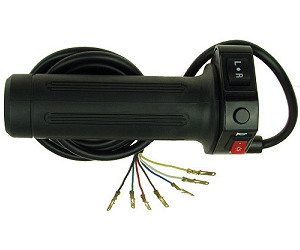 60" long cable with 7 wires and 2.8mm male terminals for white wire connectors. Fits standard 7/8" (22mm) electric scooter and bicycle handlebars. Switch cluster with handlebar grip for electric scooters and bikes. 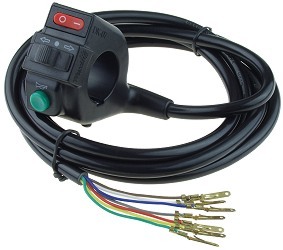 Switches for head and tail lights, horn, and turn signals. 60" long cable with 7 wires and 2.8mm male terminals for white wire connectors. Fits standard 7/8" (22mm) electric scooter and bicycle handlebars.